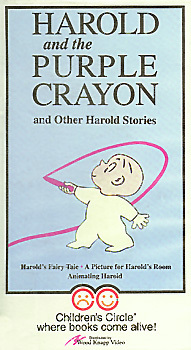 Harold and the Purple Crayon and Other Harold Stories. Wood Knapp Video, 1993. Total time: 30 minutes. Includes the following short films. Harold and the Purple Crayon. Directed by David Piel. Narration by Norman Rose. Music by Jimmy Carroll. Produced by David Piel in association with Robert Sagalyn and Stanley Flink. Brandon Films, 1959. Harold's Fairy Tale. Directed by Gene Deitch. Animation by Bohumil Sejda. Music by Karel Velebny. Produced by Morton Schindel. Weston Woods Studios, 1974. A Picture for Harold's Room. Directed by Gene Deitch. Animated by Bohumil Sejda. Music from the string quartet in B-minor by Leopold Kozeluh, played on the Prague by Janacek Quartet. Produced by Morton Schindel. Weston Woods Studios, 1971. Animating Harold. Very short documentary excerpt in which Gene Deitch tells us how Harold's Fairy Taleand A Picture for Harold's Room were animated, and recalls a piece of advice from Crockett Johnson: "Never overlook the art of the seemingly simple." Alice of Wonderland in Paris. Directed by Gene Deitch. 1966. Total time: 52 minutes. JEF Films International S.A., 1995. When Alice (of Wonderland) and Pepito (a relative of Anatole) travel to Paris, their journey links together five short, animated films based on the following books: Eve Titus' Anatole (1956), Ludwig Bemelmans' Madeline and the Bad Hat (1957), James Thurber's Many Moons (1943), Crockett Johnson's The Frowning Prince (1965), and Bemelmans' Madeline and the Gypsies (1959). Information on the Harold series can also be found on the FAQ; or, go directly to the HBO Family Channel. For a complete list of films, see the Crockett Johnson Homepage's Bibliography. For questions about the Harold videotape, please read the FAQ.